Lübeck is a former Hanseatic League city located along the river Trave, about 50km northeast from Hamburg and 20km from the Baltic sea coast. It was founded in the 12th century and quickly became a prospering trading centre in northern Europe and the "Queen City" of the Hanseatic League. 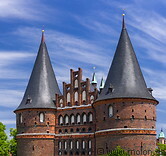 Lübeck was heavily damaged during World War II, but due to postwar reconstruction efforts it nowadays has a well-preserved old city with 15th- and 16th-century patrician houses and other structures, such as the famous Holstentor gate in the west of the city, which is the emblem of Lübeck. The harbour of Lübeck is currently the largest German Baltic sea port. 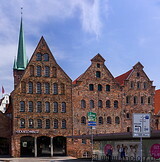 The historic centre of Lübeck has been a UNESCO world heritage site since 1987.